The Osteo Ohm Tuning Fork can be activated on a table top or practitioner activator. However, because of its length, we recommend using a mallet to strike the weighted end to activate. Activating the Osteo Ohm with a mallet provides a strong and clear sustain. Use Osteo Ohm Tuning Fork on the vertebrae of the spine and on the joints of the body to relieve pain, reduce inflammation and increase bone density. The frequency of this tuning fork is 34 hz. Recent research indicates that low sound frequency enhances bone density in animals and humans. The results show that frequencies which lie between 25-150 hz have been instrumental in healing muscles, bones, tendons, and ligaments, and helpful in relieving pain. In fact, researchers found that application of vibrational frequencies in this range helped to relieve pain in over 80 % of the participants with both acute and chronic pain. Ohm Therapeutics includes three Ohm frequencies within this range: the Mid Ohm, the Low Ohm, and the Osteo Ohm. An exciting part of this research comes from studying the vibration of purring cats. Dr. Clinton Rubin researched and discovered that frequencies between 25 – 50 hz can increase bone density by as much as 20 %. The application of this frequency can heal broken bones and encourages bone regeneration. These discoveries are also reminiscent of the predictions by Edgar Cayce, the Sleeping Prophet, who in the 1930’s said that by 2020 we would be able to regenerate limbs. For those of us who have been employing Sound Healing in our treatments for years, this news is exciting but not surprising! 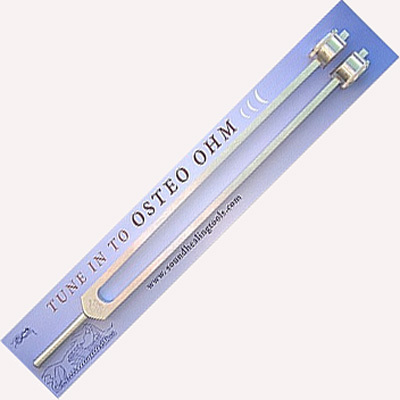 The Osteo Ohm Tuning Fork can be activated on a table top or practitioner activator. However, because of its length, we recommend using a mallet to strike the weighted end to activate. Activating the Osteo Ohm with a mallet provides a strong and clear sustain.